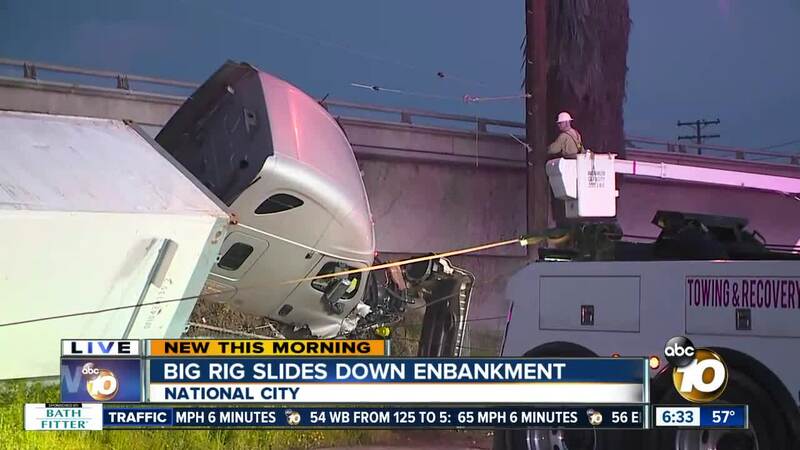 NATIONAL CITY, Calif. (KGTV) – A big rig truck veered off Interstate 5 in the National City area, tumbled down an embankment and landed near several powerlines, causing the closure of nearby streets Thursday morning. The crash involving a Dole truck happened shortly before 4:15 a.m. off northbound I-5 near Main Street, according to the California Highway Patrol. The truck’s driver told 10News a tire blew out, causing him to lose control of the big rig. As the truck, which was hauling four pallets of pineapples, veered off the freeway, it hit another car and then went down a hillside on Roosevelt Avenue. The truck came to rest on its side near several powerlines. The driver was not hurt, and no other injuries were reported.